Recently we kept yet another fire truck on the road. 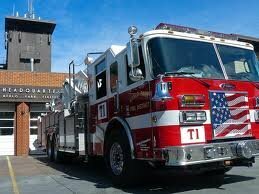 Just about every week we build leaf springs for one fire truck or another, and it seems that these life-saving vehicles are having more and more trouble finding a shop that can build their springs and build them fast. These days we are taking orders for these heavy-duty springs from ever-farther-away locations. Trucks can get their springs from other places of course, if they are willing and able to wait weeks. But we can usually get them out within a day of getting the information for the order. Obviously, everyone wants to keep fire trucks rolling. Downtime for these beasts can be costly, in many ways. Follow this link for a great discussion about why these rigs’ leaf springs need frequent replacement. This week, the springs we built were for a Pierce manufactured fire truck; Pierce rigs are used by fire departments all over the United States.